We don't have many vegan take-away option in our town, but we do have a Çiğköftem. This Turkish chain serves çiğköfte, little cold 'meat' rolls made of bulgur grains, walnuts, tomato paste and herbs that are accidentally vegan. The köfte are very delicious but not at all low carb friendly. That's why I decided to try and make this nut based version and it came out really good! More by accident than by intention, this recipe is also paleo friendly. You could even make it completely raw with homemade raw dehydrated tomato paste, if that's your thing. This recipe is half almond flour based, but you could use any type of neutral tasting ground up nut or seed you like or have lying around (hemp, sunflower etc.). For extra protein, you could even use rehydrated ground up tvp (soya chunks) instead of the almond flour. 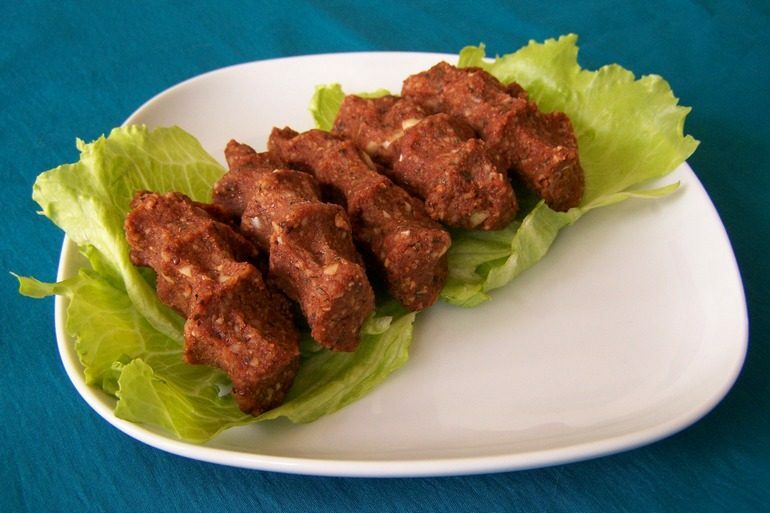 However, don't omit the second ingredient, ground walnuts, because they give it that authentic çiğköfte flavor. If you make it as written this whole recipe (two filling servings) contains about 20 grams of carbohydrate. Serve the köfte with lettuce wraps and/or low carb flour tortillas. It tastes even better with some fresh mint, parsley and lemon juice on the side. You can eat these as dinner or lunch, but they also make a fun snack, appetizer or part of a mezze platter. The traditional way to eat these is to wrap them in some lettuce and tortilla with some herbs and lemon juice and munch away. Great food on a hot summer's day. Add all the ingredients into a bowl and mash them with a fork until they form a thick doughy mass. Don't add extra water, or the dough will be too soft and you won't be able to shape the köfte. It can take a while before everything is mixed well, but just keep mashing and you'll be okay. If you are in a hurry you can start making the köfte right away, but it will be easier if you let the mixture firm up in the fridge four a couple of hours. The taste will also be better if you let it rest. Take one or two tablespoons of the dough and shape it into balls or rolls. The traditional shape for çiğköfte is a roll that you squeaze in your fist, so you see the indentations of the inside of your fingers and hand palm, as in the photo. Depending on the size, this recipe makes 10 to 20 köfte. Pile them onto a plate and serve immediately, or cover them with foil and store in the fridge for up to three days. The whole recipe contains about 1170 kcal, 104 g fat (9 g saturated), 25 g net carbohydrates, 25 g fiber en 37 g protein. Sounds awesome! Thank you for the substitution tips.